Want to grow weed indoors? There is definite appeal when it comes to growing your own marijuana at home. For obvious reasons, like easy access and quality control for your own usage, or to make some easy revenue. However, have you considered some of the less known benefits of growing weed in your home? You can control the climate you grow in and even possibly get multiple harvests! Many people find growing marijuana indoors to be both fun and relaxing. With the right information, starting out isn’t difficult at all. You’ll want to choose a space that is well ventilated and has easy access to water. Fortunately, by taking different measures, such as using LED grow lights and the proper electrical equipment, the risk of danger to your home is significantly decreased. You might think that you’d need a space with direct sunlight to grow successfully, but with the variety of LED grow lights and other, HID and fluorescent lights on the market, it is not a necessary measure to be taken. There are several common growing mediums to consider. They each have both benefits and drawbacks, so you’ll have to weigh out the options for yourself, and choose what is most important to you in your marijuana growing journey. This is the most popular marijuana growing medium. It may sound as simple as digging up the dirt from your backyard, but I assure you, that is not what you want to do. Using traditional soil may produce a better quality and flavor from your marijuana. Just keep in mind, every single microbe, every tiny mineral, even the negative thoughts of the local earthworms can affect your yield. It is best to use specifically formulated soil for growing marijuana. Your local indoor gardening store can direct you toward reliable brands. You’ll find that oftentimes a mix of a couple varieties works best. If you are incredibly ambitious, and have both the space and gardening experience, you might consider cultivating your own soil through composting. But this is for the very special, dedicated few who can spare the time and effort. There are a couple different ways you can grow without soil. First, is a nutritional soil substitute, such as Coco Coir or Vermiculite, sometimes with Perlite added to it for better drainage. These can get a yield faster than traditional soil, but you won’t get the distinction of flavor from your yield. Hydroponics is an innovative method of soilless cultivation. While your marijuana may grow faster, yielding more buds, with greater potency with this method, it takes more electricity to run the water, and it definitely requires more space. While for a long time, HID was considered the classic standard for indoor marijuana gardening, LED grow lights have now dominated the market. When it comes to LED vs. HID, we think there are just too many drawbacks to using the older HID style. They run very hot. If you use an HID bulb, you will definitely need to run a fan to vent the heat out. Furthermore, this can be dangerous. With all the electrical requirements and fertilizers, you could easily be faced with an accidental fire. LED grow lights save you in electrical costs. Not only will you obviously save energy by negating your reliance on fans to vent heat, LED grow lights use far less electricity in the first place. You can save hundreds over the course of just one year. LED Grow lights may cost more up front, but they are usually the best way to go. Many Growers prefer the ease of an all-in-one growing station or tent that provides ideal temperature control, reflective surfaces and proper drainage. But if you are growing a large amount, this probably won’t work for you. Setting up the proper indoor marijuana growing space will ensure the success of your yield, whether it is for business or for pleasure. 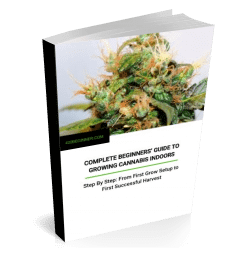 Find out more about setting up your own indoor grow space and planning an indoor grow. Learn how to grow weed indoors with our beginners’ guide. Check out these 5 Tips & Hacks for Beginner Cannabis Growers. If you’ve read all of the above and you’re looking for something book length, Grow Your Own is a very nice new intro to growing. Or if you want to know pretty much all there is to know, check out . It’s not cheap, but if you’re serious about growing, it could be an excellent investment. Wow! Is it anything like this? https://hightimes.com/grow/common-weed-mutations/4/ Hope yours have started growing normally now? There are some interesting, and even kind of cool mutations out there. But as this video mentions, the mutations aren’t always helpful, so you don’t always get to see what they look like as mature plants.